Its headquarters were in the town of Coleraine. Small towns in the area include Garvagh, Portrush, Portstewart and Kilrea. The borough council area, together with the neighbouring district of Limavady and part of Derry City Council, formed the East Londonderry constituency for elections to the Westminster Parliament and Northern Ireland Assembly. 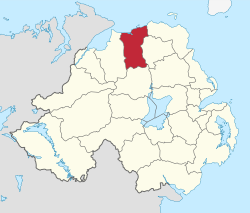 The area covered by Coleraine Borough Council has a population of 69,067 residents according to the 2011 Northern Ireland census. Coleraine Borough Council Facts for Kids. Kiddle Encyclopedia.